During the month of September 3 Humboldt, SK restaurants are creating and serving their best “burger combo with friend fries”! A portion of the proceeds going directly to our agency! 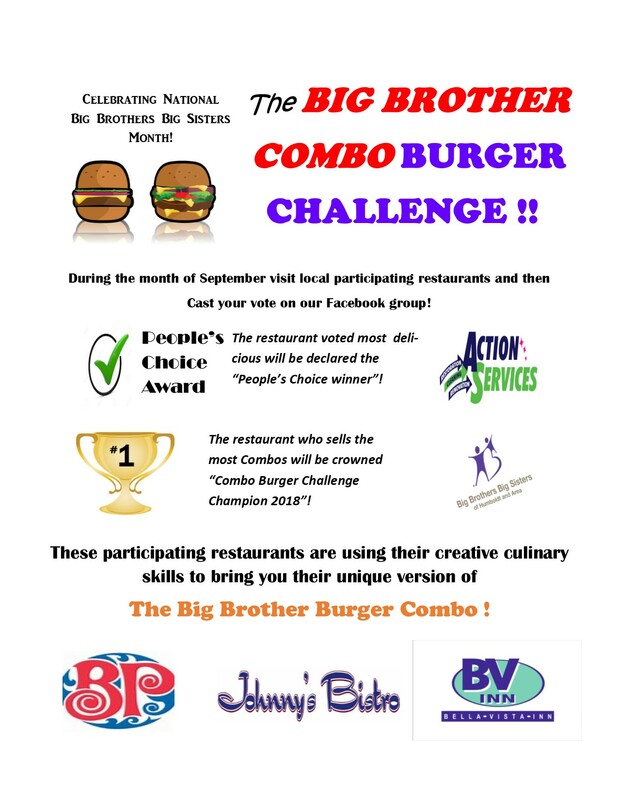 You can vote for your favorite on our Facebook page under ‘Burger Challenge’ group! Trophies will be handed out at month end for most combos sold AND people’s choice! Voting has never tasted so good! Twitter followers can use #bigbrothercombo! Make sure your September lunch schedule includes Boston Pizza, Rookies @ the BV Inn and Johnny’s Bistro @ the Pioneer hotel!! A BIG thank you to Action Services for their sponsorship!! Watch our FB page for photos and live videos all month long!